Examples include “Hug someone” and “Name 2 healthy ways you can relax"
Promote peaceful group sessions with positive directions and questions such as "Hug someone" and "Name 2 healthy ways you can relax." Also features calming activity suggestions like "Close your eyes and imagine children playing. Describe what you see" and "Clench your fists tightly, then release and shake them out." 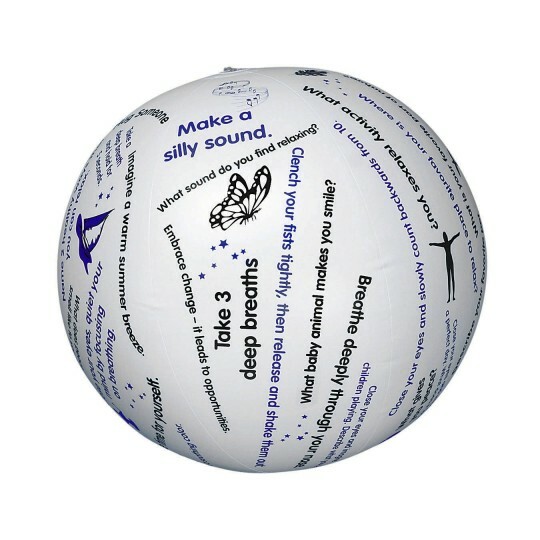 This unique 24" inflatable ball is printed with simple instructions or questions that will encourage social interaction, reminiscing, relaxation, self-esteem or just exploring personal feelings. Perfect for one-on one sessions or group activities, it is easily adapted for all age and functioning levels. 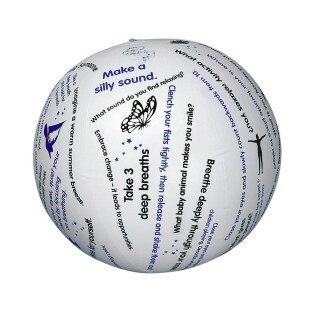 Each ball also includes a handy activity sheet with ideas for play. In our Assisted living home we toss the ball for relaxation and memory enhancement as a group. It's fun to share new thoughts . We sit in a circle and start with a few deep breaths. Then we toss the ball gently to each other. Oftentimes many stories come about and we always end in laughter. This ball has worked well with my Walking down Memory LAne class. They seniors have fun tossing it around and telling their stories and lots of laughs.